As house prices around Washington have risen over the past few years, everyone from friends to real estate agents offer the same advice: “Have you considered a cheaper area?” However, this advice really only works for an individual person looking for a house. Applied to an entire city, county, or region, this advice doesn’t work very well. 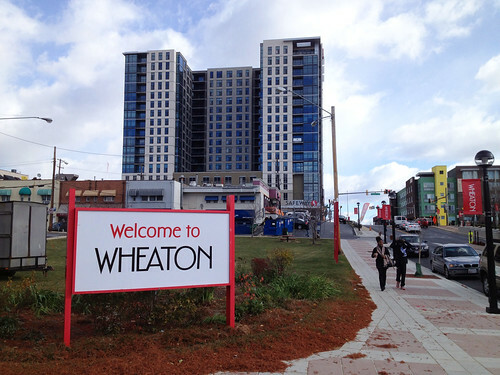 Wheaton may be more affordable than other parts of Montgomery County, but it's not guaranteed to stay that way. Image by the author. Last week, candidates for Montgomery County executive spoke to the Greater Capital Area Association of Realtors, a group that represents real estate agents in the county and the District of Columbia. (Full disclosure: I am a member of GCAAR, though I didn’t attend the event.) As David Alpert wrote last week, each of the candidates were asked where they’d recommend a young couple making $100,000 per year should live in the county. Two of the candidates, Roger Berliner and David Blair, suggested that they look at Silver Spring or Wheaton. Would our hypothetical couple actually be able to do that? $100,000 seems like a lot of money and it is, though it’s actually a little lower than the county’s median household income of $100,352 per year. But what can they actually afford here? A couple making $100,000 per year makes about $8,333 per month in monthly income before taxes. Most lenders require that homebuyers spend no more than 36 percent of their income on debt, and will subtract any other debts from that amount to get their mortgage payment. (That percentage is higher for government-backed FHA loans.) They’re just out of school, so let’s assume they each have $351 a month in student loan debt, which is the national average. That leaves a monthly payment of $2,250. Assuming they can produce a down payment of $20,000 (or five percent of the purchase price), they could afford a home of about $400,000. That’s just below the county’s median home value of $420,000, according to Bright MLS, the region's multiple listing service. A map of which zip codes have more homes for sale under $400,000. Data from Bright MLS. Image by the author. Click to make it bigger! And here’s where that advice works out: as of January 17, 2018, there are 389 homes in Montgomery County priced below $400,000 and with two or more bedrooms. 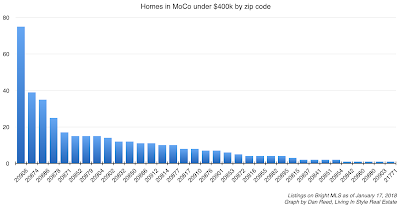 Seventy-five of those homes, or about one out of five, are in zip code 20906, which (depending on who you ask) is part of Silver Spring, Wheaton, or neither. The Glenmont Metro station is at the very southern edge of this zip code, so most homes here aren't close enough to walk to it. Meanwhile, all of the other zip codes with a bunch of homes our hypothetical couple could afford are all in the Upcounty, further from jobs and other amenities. Zip code 20874 (Germantown) has 39 listings in their range, while zip code 20886 (Montgomery Village) has 35. Gaithersburg zip code 20878 has 25, while 20871 (Clarksburg) has 17. What if our hypothetical buyers wanted to look inside the Beltway? They’d still have a few choices. 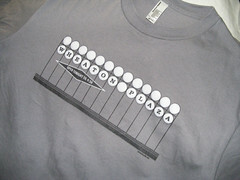 Zip code 20910 (downtown Silver Spring) has eight homes under $400,000, while 20814 (downtown Bethesda) has ten homes. 20902 (Wheaton and Forest Glen) has fourteen homes under $400,000. It's worth noting that most of these homes are condos. If I were working with one couple looking for one house, this would be great! They’d have a few choices of different neighborhoods and home styles and likely be able to find something that meets their needs. A graph of homes currently for sale in Montgomery County under $400,000, arranged by zip code. Data from Bright MLS. Image by the author. That said, much of the county would be off-limits to them. Most zip codes have only a handful of homes our couple could afford, and several have just one or two. 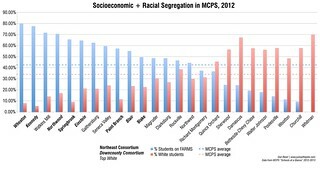 Yet those are the areas that are close to transit, jobs, and sought-after schools. And of course, there isn’t just one couple, but thousands looking for a home in this price range. Many of them are currently renting in the county, but not everyone wants to do that forever. 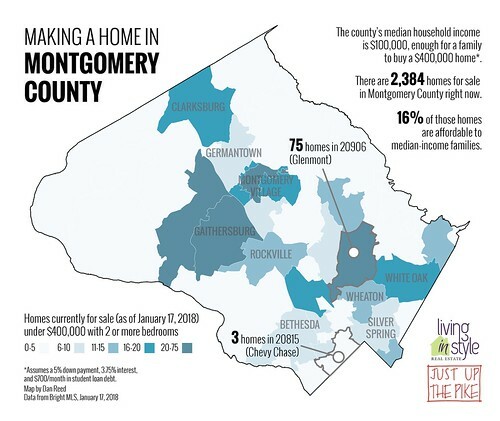 Their income is too high to participate in Montgomery County's subsidized housing program. When they’re ready to buy, finding the right home could be a challenge. Berliner and Blair presumably recommended Silver Spring or Wheaton because for a long time they’ve been perceived as “more affordable” than the rest of the county. While that may have been the case in the past, the secret’s out: lots of people have already sought out these places because they’re cheaper than the west side of Montgomery County and, increasingly, much of the District. That demand pushes prices up, and many people who live in Silver Spring or Wheaton today may be pushed out to other, “more affordable” places. I know people who have moved to towns like Hyattsville or Mount Rainier because of this, but they in turn may end up pushing other people out. Ultimately, the solution is to provide more housing so that people at all income levels can actually have choices for where to live. The Montgomery County Planning Department anticipates that almost 200,000 people will move to the county in the coming decades, and they’ll need 83,000 new homes. Stephen Fuller, the economist from George Mason University, notes that most of those homes will need to be affordable to working- and middle-class households. This is what our candidates for County Executive, County Council, and other local offices need to be talking about. As a real estate agent, I can tell you that your best bet might be the cheaper area next to the area you’d like in. However, if you’re an elected official, we need a vision for providing more homes.